Eight brand new schools, nine replacements of old ones and seven modernizations will address enrolment growth and revitalize older schools while creating thousands of jobs for Albertans. Planning funds have also been earmarked for two additional schools, with construction dollars expected at a later date. Budget 2017 allocates $500 million for these projects, the first of which will be ready for occupancy in September 2021. New schools will address enrolment pressures in fast-growing urban areas of Edmonton, Calgary, Airdrie and Lethbridge. The nine replacement schools are located in Banff, Rivière Qui Barre, Grande Prairie, Irma, Iron Springs, Sherwood Park, Medicine Hat and two sites in Edmonton. The seven schools to be modernized are located in Drayton Valley, Bonnyville, Grande Prairie, Edmonton, Red Deer, Spruce Grove, and Calgary. Modernizations provide improvements to older facilities such as building envelope upgrades, electrical and mechanical improvements and other functional upgrades to ensure students have access to effective and modern learning environments. Two projects, the Ellerslie-area school in Edmonton and the Lethbridge elementary, have been approved for design dollars with full construction funding expected later. These 26 school projects will create more than 6,000 jobs. For almost all of the projects, construction will likely begin in 2018 after design is complete and schools are projected to begin opening in 2021. 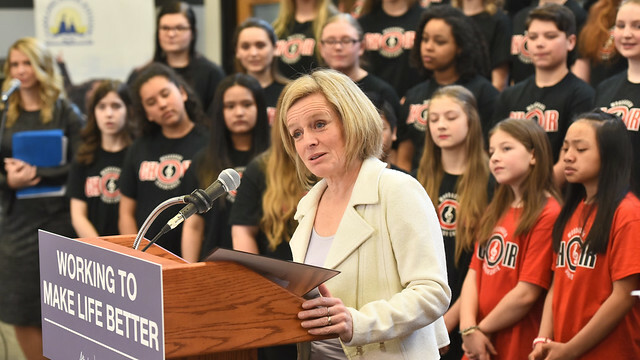 Premier Rachel Notley and Education Minister David Eggen joined school trustees and students at Woodhaven Middle School in Spruce Grove to celebrate its planned modernization while Finance Minister Joe Ceci did the same at Forest Lawn High School in Calgary, which is also due for a substantial renovation.